Rosemary’s depiction is quite true to life. Occasionally as we have seen this decade extensions of the polar vortex dip very far to the south across North America in winter producing exceptionally cold weather here while most of the rest of the globe remains quite balmy due to global warming. The winters of 2013 and 2014 were the last to see very deep, strong lobes of the polar vortex digging into the U.S.
Back in the colder decades of the 1970s and 1980 when I began studying weather patterns in earnest, though, there used to be full latitude troughs frequently digging south through North America from October through April. What has changed? We aren’t seeing near as much amplification in fall and early spring, shortening winters for most. What appears to be happening is shorter but sometimes more intense winters leading to some of those “Extreme Temperature Records” that I’ve devoted my life to studying and cataloging for climate research. The key researcher in this area is Dr. Jennifer Francis. Here is the latest New York Times piece on her work as well as the latest round of cold weather to hit the U.S. The cold snap may feel especially shocking after an unusually warm few weeks. Colder temperatures have been arriving later in winter over the past few years, according to Judah Cohen, a climatologist at Atmospheric and Environmental Research, a weather risk assessment firm. But because of changes to the polar vortex, when wintry weather does arrive, it’s often more intense — witness the four back-to-back nor’easters last year. A major snowstorm pummeled parts of California last week, blanketed the Plains with blizzardlike conditions and dumped snow on the Midwest and East Coast over the weekend. But with the storm cleared out, the effects of a dipping polar vortex have arrived. Monday’s high temperature in New York City is predicted to reach just 16 degrees, 20 degrees below average, according to the forecasting service Weather Underground. It’s interesting, though, that in Atlanta, my home town, the first big polar charge last weekend only produced an official lowest minimum of 22F. It has not gotten below 20F here so far this winter season. 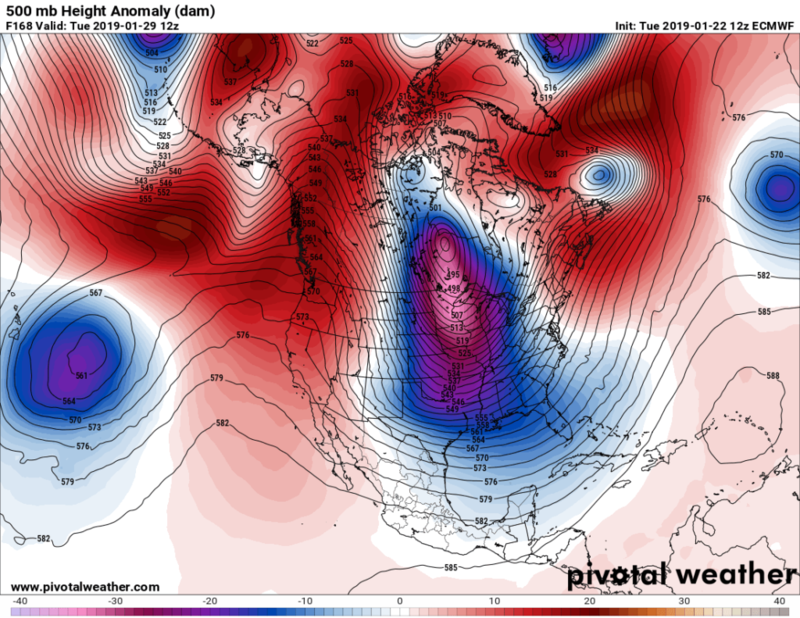 The next polar outbreak may not be any colder as we move towards February. Frequently during the 1970s and 1980s here mins went down into the teens and lower during winter. Are winters really remaining intense as far south as Atlanta? I think not given my experience living here the past 40+ years. The jury remains out on this burgeoning science theorizing that winters can remain as intense as they were decades ago during the heart of the Northern Hemisphere’s cold season, which is January. We will continue to observe and then report on “ETs” with these cold waves. "Is Mark Jacobson’s @mzjacobson Plan to Use 100% #RenewableEnergy Feasible?" We are witnessing the social tipping point. After it tips far enough, meaningful large-scale action will follow rapidly. And action=hope.